Computers are an increasingly important tool for communication, employment, education, and recreation. 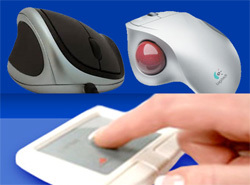 However, standard computer use requires good fine motor control to type on a keyboard and use a mouse, touchpad, or touchscreen; and good vision to see the monitor. For people who have difficulty in these areas, there are a number of hardware and software accommodations that might be of assistance. A computer access accommodation can be as simple as an ergonomic solution that supports more neutral wrist postures. A variety of ergonomic keyboards and mice, trackballs, and simple ergonomic wrist rests have been developed for the general population. Other solutions accommodate problems with fine motor control by “steering” the cursor with a joystick or providing larger keys, greater spacing between keys, or keyguards that separate keys on the keyboard. Limited range of motion can be accommodated with USB touchpads that only require small finger movements to control the cursor, small keyboards, or a variety of one-handed keyboard designs. The hands can be bypassed entirely by alternative keyboards and mice that use movement of the head, chin, tongue, eyes, elbows, shoulders, or legs. Some power wheelchairs include a mouse emulation mode, in which the same controller that someone uses to drive their chair can be used as a Bluetooth mouse. 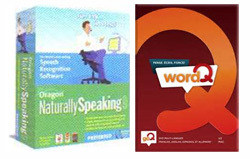 Voice recognition software, such as Dragon Naturally Speaking, can support someone in dictating text to the computer and giving voice commands so that a mouse is not necessary. Voice recognition can also be helpful for people with spelling difficulties, since the software will always spell words correctly. However, the user must recognize if the software chose the correct word. Word prediction software tries to guess what you might be typing. If it is correct, it will finish the word for you, so that you don’t need to type in the rest. This can save you some physical typing, and can also help if you have trouble correctly spelling words. Scanning software can replace the keyboard and mouse with a single switch which can be controlled by any body part, or by breath in the case of a sip-and-puff pneumatic switch. Scanning can be slow, but for someone with patience it provides control of all aspects of the computer. In addition to mouse use and typing, people might have difficulty seeing objects on the computer screen, reading text on the computer screen, or hearing alerts. For people who have difficulty seeing the computer screen, software is available to magnify objects on the screen. Other software reads aloud what objects are available on the screen, such as the names of windows or the text on buttons or menu items. For people with difficulty seeing or reading text, text-to-speech software can read text aloud, such as the text in a word processor document, a web page, and e-mail, or a PDF document. Vision can also be an issue when trying to type on the keyboard. Some keyboards provide larger font or higher contrast on the key labels; or large-font, high-contrast label stickers can be placed on the keys of any standard keyboard. For people who have difficulty hearing alerts or other sounds from the computer, software can replace auditory alerts with flashes on the screen, or enable captions in online videos. Captioning software makes captioning available as an option, but generally relies on the people who made the video to provide the text for the captions. Some accommodations are built right into Windows, Mac, and Linux computers, as well as Apple and Android smart phones, through the configuration settings. These settings can slow down or speed up the responsiveness of the keyboard or mouse, provide an onscreen keyboard or basic voice recognition, or provide a basic screen reader. More information about specific technology accommodations can be found from the sites below.